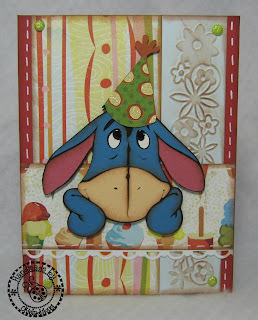 Okieladybug's Scrap N' More: And today is Eeyore! For today's card in the Winnie the Pooh series I am presenting to you this wonderful Eeyore card *okie does the hand motions around the card like one of the girls from Price is Right showcasing a fabulous prize*. I think this one might be a little busy but I do like the colors together. While a wonderful Cricut friend of mine Katy Masino has the whole list of Bazzill colors for the Disney characters I am sad to say I didn't have the right Bazzill colors and had to go with Prism cardstock, which is now owned by Bazzill. The patterned paper is Basic Grey...uhhh....*okie tries to think and almost hurts herself* CUPCAKE! That's it! Cupcake...sheesh can't believe it was so hard to remember! The embossed flowers is a Cuttlebug border that I just thought might add a little to the card. The border punch at the bottom of the horizontal strip is a Stampin Up! border punch. The shading was a bit of a booger but I do have to say I still think shading adds so much to cuts! I added a little Glossy Dimensions to Eeyore's eyes to give them a little shine. Do you know how hard it is to find cool birthday quotes for these characters?? Well I do! 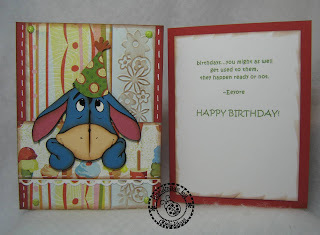 *okie cracks up* For Eeyore I chose to go with...oh whatever it says on the card, click it if you can't read it because I can't read it while trying to type this post and I am too lazy to get up and go to my card box and pull it out and read it. Well I hope you liked Eeyore and remember to check back tomorrow for another Pooh Series card! Gotta love Eyeore...he's always so cheery! lol Very cute! This is soooo darn cute! I love it...and EEore too! This is so cute!! I love your Pooh ones too. I always thought I didn't need this cart. But now thanks to you, I do--LOL! I don't think it is a bit to busy! It is just like Eeyore to be "gloomy gus" with all the party going on around him! I am totally loving your Winnie the Pooh series and hope you keep it up. Love the saying too. Again a very cute card. I think Eeyore would make a great get well card for a child. Well, let's see - #1, I like the colors, #2, I LOVE Eyore (and the shading does add a lot), and #3, the message inside the card is fantastic. Overall, THIS IS A GREAT CARD - TFS!!!!!!!! Oh, that is soooo cute. My fav is Eeyore!! I just love Eeyore!! And I love the sentiment you chose! Gotta love Eeyore! This one turned out cute! I like the cupcake paper. This card is adorable! I love Eeyore, your detail is AMAZING!! I love your pooh and eyore cards, they are so cute. Love your Eeyore card, and I think you chose the right papers (not that you asked). I have had Pooh & Friends for ages and have not cut the characters yet. I have used lots of the extras on this cart. Thanks for the inspiration! OK - OK you enabled me enough!!! I won this cartridge on ebay yesterday for $19 with free shipping. Love this series! Okie how do you do your shading? Do you use ink or chalk? I can't get mine to look anywhere near as good as yours. You are too funny! I will click to read it. Well maybe I am feeling a little lazy too. I love Eeyore too. He is the man! I love the expression on his face. Soo cute. Thanks for sharing and making me laugh. Just wanted to drop a line and say thank you for all the inspiration I get for your site. I just started making cards last Christmas and it can become an addicting habit! um yea, Thank you....now i have to go out and get another freakin cart....my 15y/o daughter (whom we so appropriately call ASHPOOH) saw this blog and now wants me to go and get the Pooh cart....good thing is, my husband wont mind since he does anything for our baby girl!!! I love this card! Yes, the shading does add a lot. I'm really enjoying the Winnie the Pooh collection. Will you be doing a Tiger or Piglet? Also, where did you get your "Hand Made by" stamp? Love this card! Love all of the Pooh series! I agree about the shading, yes it can be a pain in the you know what, but it does add so much! TFS! "Birthdays, you might as well get use them them, they are going to happen, ready or not." Now how true is that ... however, at this point in my life, I'd sure like to see that number subtracted instead of added!!! *wink* Can Eeyore help me with that! Love this card too, it's another cutie! Awww this is sooo cute...I am loving your serie! TFS! I am so loving your Pooh card series and I really love the shading. After I viewed your Eeyore and looked at mine without shading-it's time for a make-over!!! Thanks so much for sharing and the inspiration!!!! You did a great job on the shading! Really brings Eeyore to life. All hail to the Queen!!!!! THIS IS AWESOME! YOU ARE SO GOOD WITH COLORS! AND I LOVE THE SAYING! I agree that shading is tricky with these cuts, I found using a triangle makeup sponge a big help in the tiny nooks.